Awhile ago as I was journaling I had a very vivid picture come to my mind. I was in the ocean on a calm, sunny day. The water was clear and warm. I felt myself sinking beneath the surface and as I looked up I could see the sun shining on the rippling waves as the distance grew greater. I had no sense of danger or panic. I didn’t go very far before I looked down and sitting on the sandy bottom quite a ways below me was a good old fashioned treasure chest. I then had the sense that I did not yet have the tools or equipment to dive to open the lid. I had a sense of foreboding as if there was something dark inside, maybe it was from my past or a new area of growth to see, something I needed to know, but was very unpleasant. I decided to rest in the fact that if God wanted me to open it, He would equip me. Some time later, as I wrote down my thoughts as I often do, the picture came back. This time I was nearing the deeper water and the chest was within reach. I had been processing some hard things so I figured this journey would lead me to some insight. 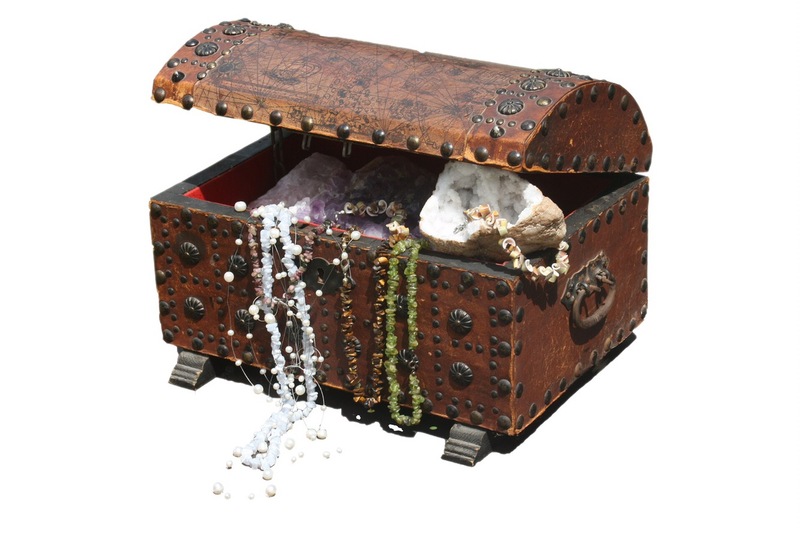 I pushed back the lid with the realization that is was not a dark or sad thing, but a chest of treasure! I still recall the feelings of relief and joy! I looked in and saw that there were gold and jewels. The stuff of pirate booty legend. As I looked closer I noticed there were some plastic trinkets among the gold and jewels. It was going to be time to sort through and take out the things that suddenly didn’t have value compared to the other precious things they were next to. Here in the depths with actual gold and gems, plastic didn’t hold any appeal. It was as if the gracious hand of my loving Father was going to guide me through an inventory and I felt somewhat sheepish, but mostly grateful. And a light bulb goes on. Could my Heavenly Father have even been using this picture in my mind to prepare me for this part of my journey, in the depths, in the valley? I marvel. I am in awe. Such love! How can it be? Jewels? Gems? Things hidden in the depths that He had to prepare me for and equip me to see? Not dark or scary, though desperately needing His presence and perspective to take it all in. Who knew the necessary scuba equipment was loss, pain. So I shake my head at His creativity and care and I look forward to letting go of the trinkets and digging deeper to find the treasures He had prepared and stored here for me for such a time as this. Wow Julie, I am in awe of your beautifully hard story. Thank you for sharing your depths with us. Jewels indeed! Thank you for sharing openly and vulnerably with us. Praying for the Lord’s continued grace and peace for you. Wow. He is so good!